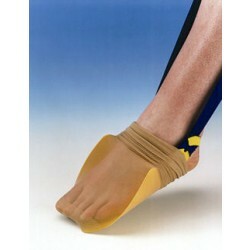 This section includes sock aids, leg lifters, long shoe horns, elastic shoelaces, button hooks and zip pulls. We all have times when we might need a little help with everyday situations. Aids include hosiery helpers which make it easy to slip on socks, stockings or compression wear without having to ask for help. Easier, simpler and faster for you to get up and go. Also extended shoe horns as well as leg-loops to assist with lifting your leg that may have limited strength due to hip injury/operation. It has become easier to wear support stockings every day without looking obvious. Man or woman, young or old, compression stockings can help increase blood circulation throughout your body, which helps boost your energy levels and reduce swelling, tiredness, muscle fatigue or soreness in your legs and lower body. Our Ezy-on range makes, what can be a tough job, easy. Sitting or standing, helping a loved one or on your own. 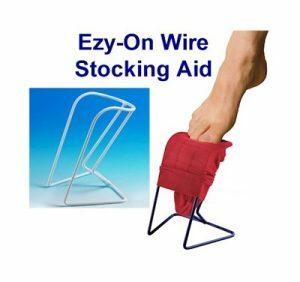 Suitable for most types and lengths of stocking. We stock a range of shoe horns of varying length and materials. Shoe Helper – a clever device, a shoe horn attached to the end of a Helping Hand grabber, it can be used to grab hold of a shoe or slipper and position ready to use the shoe horn, all without the need to bend down. Elastic shoe laces are available in various colours, these can replace standard shoe laces making it easier to get shoes on and off. Buttons and zips can be a challenge for those with painful arthritic hands or tremors. These gadgets can be an enormous help. Long handled toe nail scissors, nail clippers with magnifier and long handled combs are just some of the items we have to help make your everyday life a little easier and keep you independent.